The U.S. water supply is generally considered among the best and safest in the world. However, many water and security experts agree that it offers an attractive target for terrorists, and that threats could come from either contamination or from disruption of the distribution system. In his 2005 resignation speech, former Health and Human Services Secretary Tommy Thompson warned that an attack on the nation’s food and water supply would be “easy to do.” One reason is that there are so many targets. The nation’s 50,000 community and 200,000 public and private water systems operate hundreds of treatment centers, thousands of miles of pipeline, and countless remote pump stations—which are often many miles away from the nearest law enforcement station. In 1993, a naturally occurring parasite made its way into the Milwaukee drinking water system, resulting in about 100 deaths and 400,000 gastrointestinal illnesses. If a water-borne protozoan could infect 400,000 people in one city, how many more lives could be lost through the deliberate introduction of a potent chemical or biological agent into the water supply of a major metropolitan area? Many experts say such an event is unlikely, because most reservoirs contain thousands of gallons of water, which would require a large amount of a contaminant to be effective. Standard filtration and disinfection of the water further mitigates any contamination. Yet even a small amount of contaminant released after the final treatment process could cause widespread panic and distrust of the public water system, locally and nationwide. Treatment facilities are required by law to monitor water on a regular basis for biological and chemical contaminants. However, the facilities are unable to test for all known toxins, and there are no widely available real-time tests for biological pathogens and only limited capabilities for potential chemical contaminants. However, that may soon change. Using a U.S. Environmental Protection Agency grant, the city of Tucson, Ariz., is testing a laser system designed to detect microbes in water within seconds and identify them in minutes. Currently, water samples can take days or weeks to check in a laboratory. The test of the new system is expected to extend into 2010. Where the water supply may be most vulnerable is in the transmission and delivery stages. Many different state and local agencies and private companies control the nation’s highly distributed design, which allows for needed flexibility when one part of the system fails or requires maintenance. Yet, all of those dams, reservoirs, lakes, treatment and filtration systems, pipes, pumps, and valves offer numerous targets for terrorists. A major disruption of this system could keep water from reaching U.S. cities. The impacts could be severe— restaurants could close; manufacturing processes could be halted; there could be frenzied rushes on retailers selling bottled water; fire departments could be unable to extinguish fires. The economic toll of such an attack would be difficult to calculate. In the months following Sept. 11, 2001, Congress passed the Public Health, Security and Bioterrorism Preparedness Act of 2002. The act required all water utilities serving more than 3,000 customers to assess their vulnerability to terrorist attacks and natural disasters, complete an emergency response plan, and submit the information to EPA. 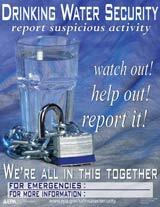 With their assessments completed, many water officials are increasing their security measures. For example, the Birmingham Water Works, Alabama’s largest water utility, has put the safety of its customers at the forefront. After its EPA assessment, the utility went to work with ADT Security Services to incorporate network-based video and access control into an integrated system to help protect the district’s water supply. Founded in 1951, the utility serves more than 600,000 customers and maintains more than 3,900 miles of transmission lines in Jefferson, Shelby, Blount, St. Clair, and Walker counties. More than 300 cameras monitor the exterior and interior of the company’s 18 locations, and about 600 access control cards have been issued for employees, vendors, contractors, and consultants. The video is transmitted via the utility’s wide area network to a security command center that is staffed around the clock. Security personnel can monitor live streaming video from nearby and remote facilities on a video wall, similar to the high-end, large video screens used by NASA. The cameras monitor Water Work’s main center, intake and pumping stations, filter plants, and treatment centers. When a person or object comes into contact with one of the electronic fences surrounding district property, PTZ cameras from opposing angles are activated to send real-time video to the command center. The cameras also send video footage from before and after the event to allow district security personnel to assess the situation and determine what triggered the alarm. The district also uses video to monitor potential problems with its supervisory control and data acquisition (SCADA) management system that provides reports on the function and performance of critical systems. If the SCADA system reports problems with water levels or pressure, the cameras are automatically activated to provide live video of water processing valves, gauges, and other essential components. Network-based audio is another part of the system. Visitors without an access card can approach each entry gate, where they can push a button activating an intercom and a camera. From the safety of the command center, security personnel are able to see and talk with visitors to either grant or deny them access to the facility. ADT worked closely with Terry Oden, security manager for Birmingham Water Works. He has an extensive background in the security industry, including 25 years with the Secret Service. As he points out, there is no way a project of this type can be completed in a piecemeal fashion. Instead, it was approached in a comprehensive and systematic manner. Oden also had the full support of senior management and a committed board of directors, who were willing to appropriate up to $15 million to get the job completed. At the time, there were no federal grants or other outside sources of funding for Birmingham’s security upgrade. Oden said his biggest obstacle is complacency. Every day that passes without incident tends to make people more complacent. One way he works to overcome that tendency is to continually practice and drill employees on the system so they will know how to respond in an emergency. This article first appeared in the January 2009 issue of Security Products.